Makoto is a Greninja who was born in Goldenrod, and works in Ecruteak, her life style pretty much reflects this as much as possible. She has lived there for ages, even after a little event in her past that she usually does not show off what was left behind from it. She works for the Kimono girls in Ecruteak and usually tends to help out by cooking food, kicking people out if they are causing trouble, or prepping the girls for their shows. She is a very calm and relaxed girl when at home or out and about, very easy to get along with, unless she is working. When she is working, she's focused, paying attention, and very much so ready to kick someone out if she has to. She's also awkward when it comes to relationships. Likes: Ecruteak City, Relaxing, Video Games, Starry Nights. Dislikes: Roughness without permission, swatting her rump, and being forced to do things. 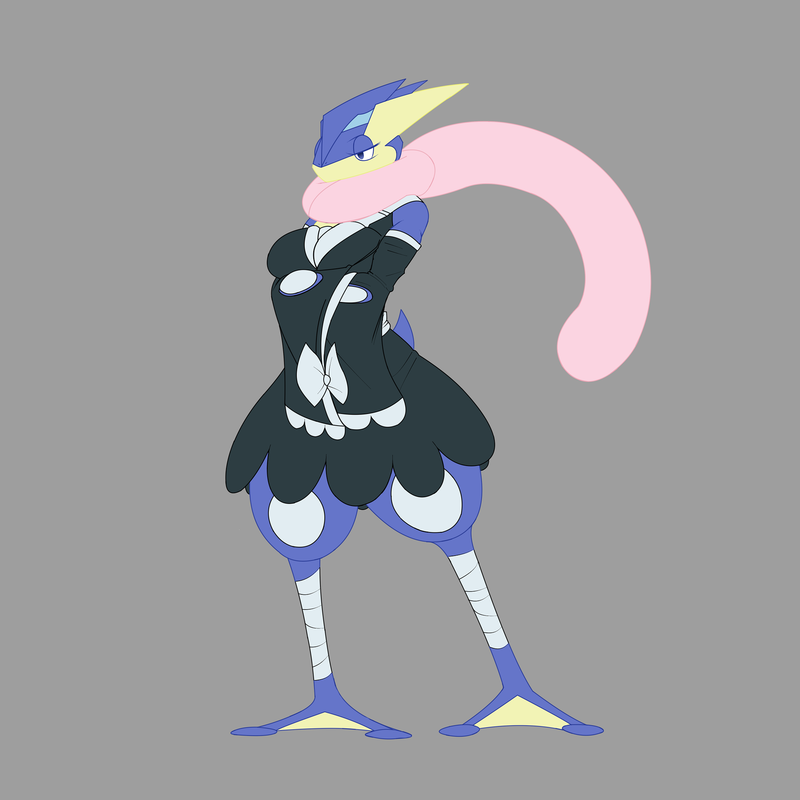 Makoto has lived in Goldenrod all her life, and used to be a Dutiful young Greninja that was prepped and ready for Kunoichi work. One day an attempt on her life was made, and she was unable to continue that work from there, but she lived thanks to an absol's helping hand. She now works for the Ecruteak City Kimono girls quite often, and can usually be seen around the Dance hall on work days. No family she'd let people know about. The major differences about her to regular greninja gals is she is more bottom heavy kinda gal, even if she's fit, and has a thicker then normal Tongue scarf. She also has a Scar on the front of her neck, that she won't normally let people see. Kimonos. Pretty much just a buncha different Kimonos for the occasion. She also has boy shorts, and bandages for at home. This is my character Makoto finally drawn and color'd. She was colored by a friend named Spooks which you can find here, https://spectrespooks.tumblr.com/ and she was Drawn by Aero-Spine on FA. I am so happy about this.